January 24 – Spanish giants Real Madrid and Barcelona have taken over at the top of this year’s Deloitte Football Money League, relegating Manchester United to third place. But all of the Premier League’s Big Six are in the top ten of the table, which monitors top-line growth among the world’s – in practice Europe’s – biggest clubs. Deloitte said that European champion club Real Madrid’s revenue jump to €750.9 million was “primarily due to commercial growth of €54.8 million, including an uplift in sponsorship, merchandising and exploitation of increasingly lucrative pre-season fixtures. At €356.2 million,” Deloitte continued, “Real Madrid now have the highest commercial revenue of any football club globally”. After Madrid, the rest of the top ten was as follows: Barcelona €690.4 million, Manchester United €666 million, Bayern Munich €629.2 million, Manchester City €568.4 million, Paris Saint-Germain €541.7 million, Liverpool €513.7 million, Chelsea €505.7 million, Arsenal €439.2 million and Tottenham Hotspur €428.3 million. Nine of the top 20 were English, four Italian, three German, three Spanish and one French. Combined revenues of this top 20 rose 6% to €8.3 billion. While Premier League club turnover was depressed by the depreciation of sterling, the impact was not sufficient to significantly change the rankings. By focusing on the top-line, this exercise gives only a partial picture of prevailing trends in European club finances. 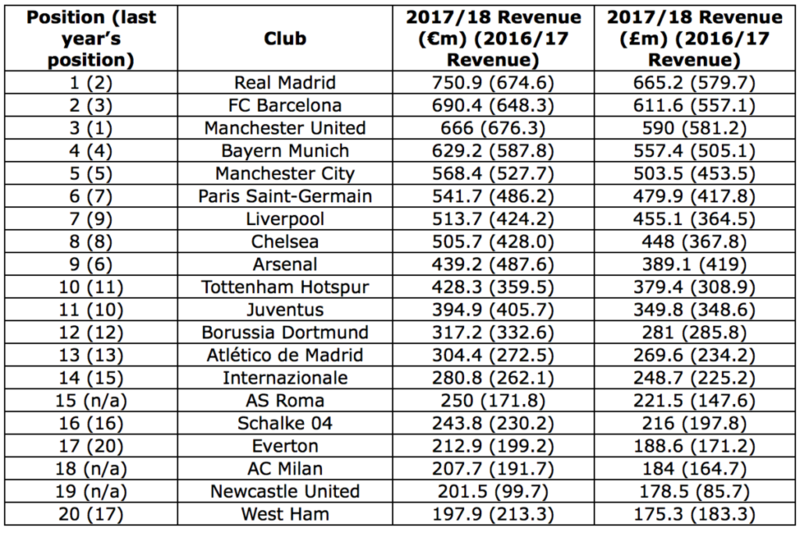 Recent seasons have seen the biggest clubs enjoying an enviable combination of strong revenue growth and relatively subdued wage hikes. This has given them lots to spend on new players, triggering inflation in the transfer market. 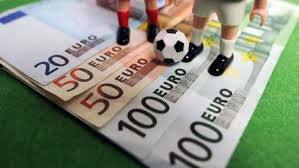 With market valuations pushed far in excess of balance-sheet values – this month’s UEFA club benchmarking report calculated that “players sold in the 2017 financial year had a combined transfer fee of €4.3 billion, but were valued at just €1.1 billion at the time of their sale” – and the amortisation process working its magic, even nominally “buying” clubs are finding net profits pumped up by gains on player sales. As reported here exclusively this week http://www.insideworldfootball.com/2019/01/21/exclusive-liverpool-look-primed-post-club-footballs-first-e100m-plus-profit/ , Liverpool are poised to unveil (probably in early March) club football’s first €100 million-plus annual net profit. It may be considerably more than €100 million. Interestingly, the three clubs elbowed out of this year’s top 20 – Leicester City, Napoli and Southampton – all featured among the top ten European clubs on the basis of net profits in the 2016-17 financial year. According to UEFA, Leicester and Napoli were first and second. “The curse of all curses is the revenue line,” according to the late Roberto Goizueta, a notably successful boss of frequent football sponsor Coca-Cola. It is not quite the same, arguably, for football clubs, but the revenue line does not the whole story tell.